Between a full-time class schedule at California Baptist University, driving north to Wasco on the weekends to be with his wife and kids, and working a part-time job, Christopher Carlberg, senior environmental science major, still manages to find time to run his own honey business, Hallelujah Honey. Prior to Hallelujah Honey, Carlberg co-founded beerescue.org, a non-profit organization dedicated to rescuing and taking care of bees. The organization is an alternative to pest control, where people can call and have bee hives safely removed as opposed to the bees being exterminated. Carlberg made the decision to come to CBU because of the students and teachers. 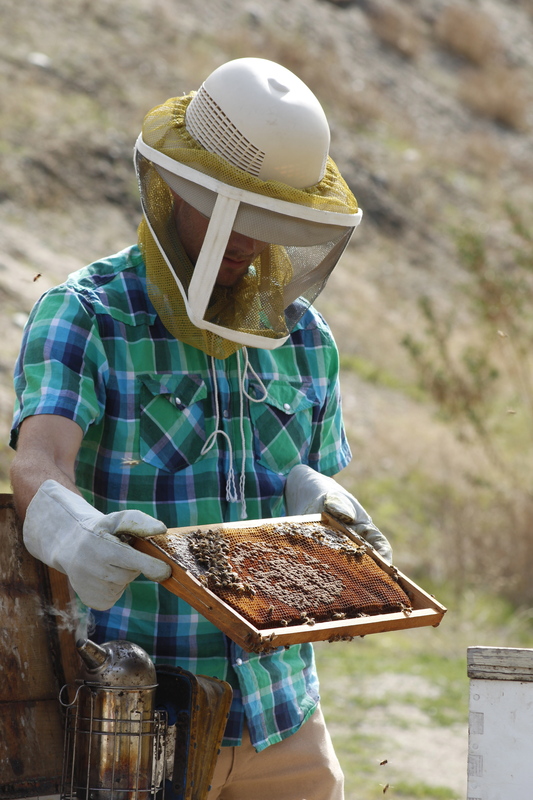 Carlberg said his choice of major was made based on the fact that CBU does not have a bee rescuing major and that so many of his passions are rooted in environmental sciences. “I found they were very special compared to other university campuses,” Carlberg said. “Professors here seem to have a grace intertwined in their syllabus and the way they teach. Carlberg’s business started Jan. 1, 2014, on the CBU campus. When the requests for honey started pouring in from fellow CBU students and faculty, Carlberg decided to follow up with those requests by opening Hallelujah Honey and revving up his production. Many of Carlberg’s first hives came from his mom and dad in Orange Park Acres, California. Now many of his hives are scattered across California. “The business started off with up to 10 bee hives in the first year and then the next year between 30-40, and fluctuated to between 20-40 hives a year,” Carlberg said. Carlberg said it is rewarding to balance his time between work, school and running his own business. Carina Martinez, senior community science major, found out about the honey from Carlberg through class. “Carlberg was in my ecology class and because he rescues bees, which are pollinators, our professor mentioned Carlberg’s honey business, which opened the discussion about Carlberg ’s business,” Martinez said. Carlberg asked Martinez several times if she wanted to buy honey, and after rejecting his offer a couple of times, she eventually bought some. Carlberg said he believes in bringing natural and locally harvested honey to people and in providing a variety of bee products, including pollen and bee wax. The honey comes in many flavors depending on the time of year such as sage, clover, almond, avocado, orange blossom and alfalfa. Carlberg said he hopes to add more flavors to the list over time. The prices for the honey range byjarsize:asmallsix-ouncejaris $5, a medium 12-ounce is $10 and a large 32-ounce jar goes for $20. “There has to be a love for the product, a desire to share with others, and most importantly, if the business is going to run well, it needs to focus on the Lord,” Carlberg said.